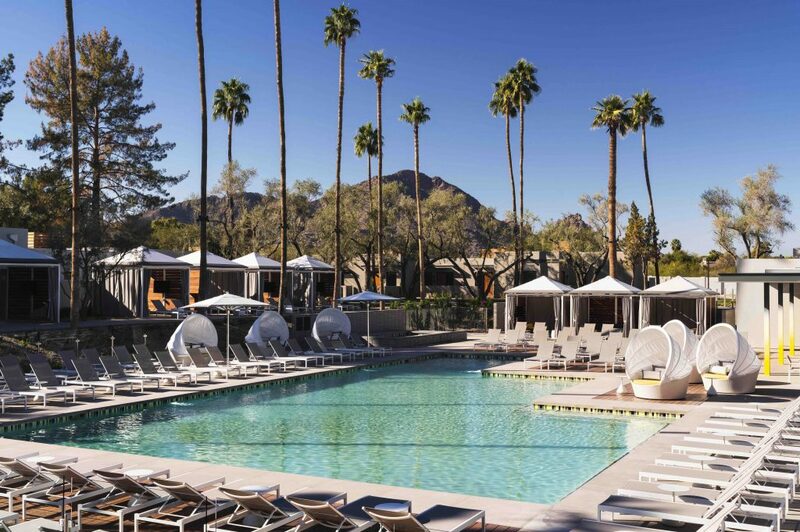 A uniquely Sonoran getaway with stunning views of Camelback Mountain, the Andaz Scottsdale Resort & Spa is a good choice if you’re looking for blue skies, private relaxation, and Arizonan cowboys. 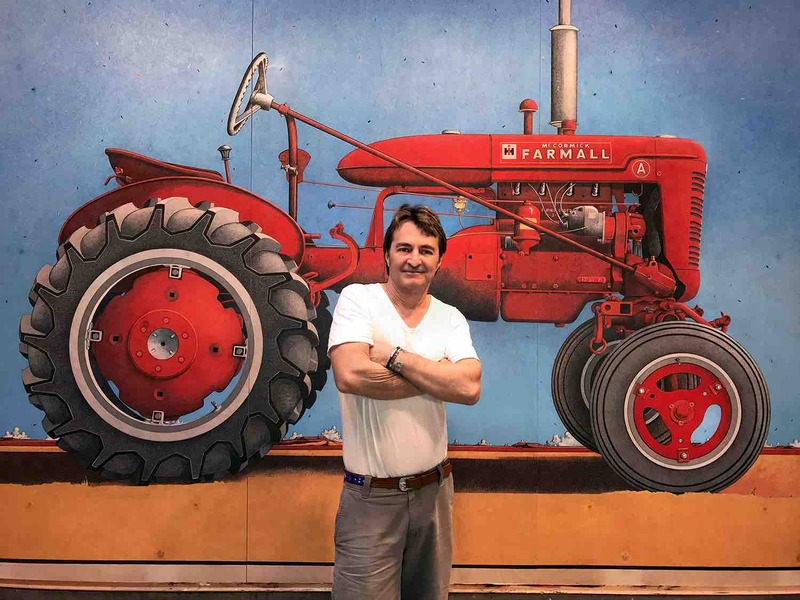 A close collaboration with Cattle Track Arts & Preservation, a local artists’ commune, creates a special feeling that you’re joining a close-knit community when you check-in. 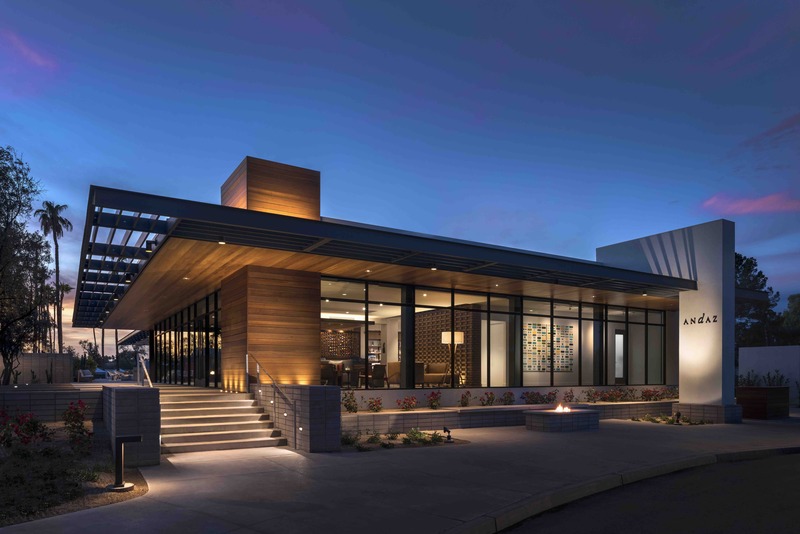 Located on 23 -acres in exclusive Paradise Valley with amazing views of Camelback Mountain, this Andaz is located two miles north of Old Town Scottsdale for galleries, museums, art walks, restaurants, and the Fashion Square shopping center. Less than a mile from the Cattle Track Arts & Preservation compound, you can ask for a quick shuttle over in the resort’s Teslas to check out these local artists’ studios. Great mountain hiking, biking and running can also be found in The Valley of the Sun. Nearby, it’s a short trip to go kayaking in the Salt River with Arizona Outback Adventures or to take a private hot air balloon ride with Hot Air Expedition (an activity that’s extra popular here because it’s almost always sunny!). The resort has an artist-in-residence program that provides guests with opportunities to interact with local artists throughout their stay. These artists create all the artwork around the resort, from painting, pottery, to photography. Once you’ve entered this secluded Andaz bubble, it’s easy to forget that you’re only 20 minutes from the Phoenix Sky Harbor International Airport. During Scottsdale peak season (winter), rooms start at $399 per night and suites start at $2,500. The (ANDAZ)RED Cabana + XL Pool View King Package starts at $629 per night, including a snack upon arrival, a signature (RED)-inspired breakfast and a special departure gift. At the Resort’s restaurant, Weft & Warp Art Bar + Kitchen, local flavors like avocado toast with cress start at $14, and room service for fresh-creations like the AZ grass fed burger ($22) cost a delivery charge of $5. Bespoke poolside cocktails start at $10. Each of the 201 bungalow-style guestrooms and suites has a shower with double showerheads, with enough space to comfortably fit 8. You’ll feel serious FOMO every second you aren’t partying with college boys from ASU in this shower. Reserve a room with a private outdoor patio to keep the party going outside, with chaise lounges and high walls for additional privacy. Perfect to fill in between your tan lines. The guestroom interiors were conceived by EDG Interior Architecture + Design, with colorful nods to mid-century designers like Alexander Girard. Guestrooms and suites range from 350 to 1,800 square feet, with Spanish-style front terraces. The Palo Verde Spa & Apothecary is worth spending a full day (or ten) at. Champagne pre- and post- personalized treatments heighten your senses to take in the novel smells and textures of indigenous ingredients, like prickly pear treatment oils. The 12,000-square-foot spa includes four indoor and three outdoor treatment rooms, outdoor hydrotherapy pools, a nail and hair salon, eucalyptus steam rooms, outdoor relaxation lounges and an exclusive private pool for spa guests. Sunbathe, steam, swim, and repeat. Next to the spa is the Andaz’s gym, whose walls come down when weather permits (i.e. when it’s not too sunny and beautiful outside). Erg outdoors with a straight-shot view of Camelback Mountain. For better people watching, take a dip in and lounge by Turquoise Pool, which has over 150 chaise lounges and day beds in addition to 13 private cabanas. Weft & Warp Art Bar + Kitchen, the Resort’s restaurant and bar, features innovative use of plancha cooking techniques by Executive Chef Adam Sheff. Delicious fresh-cooked dishes featuring local ingredients are available to eat in or order in as room service from 6:30AM to 10:00PM. For a show, order the Mercury Mirage cocktail, smoked tea infused over proofed rye whisky with smoked chili bitters. Don’t forget to take advantage of the complimentary “adult treats” by the pool every day at 11:30AM. Artsy and progressive, this Resort sees a diverse clientele, including many gay couples and families. Open Grindr and you’ll find a mix of ASU college students and pumped-up Arizonan daddies. In March this year, Andaz Scottsdale joined 4 other Andaz resorts to partner with (RED), the AIDS organization founded by Bono and Bobby Shriver. The (ANDAZ)RED Cabanas provide a portion of each booking to support (RED)’s fight to end AIDS. ManAboutWorld highlights properties we have recently and personally stayed at, and is editorial, not advertorial. Like virtually all travel publications, we sometimes accept discounted and sponsored travel, but ManAboutWorld is beholden to no one but you. Our recommendations are based solely on the experience and opinions of our editorial team and trusted network, putting our readers’ interests above all. If you ever have an issue with anything we recommend, please let us know. We always have your back, and your travel satisfaction in mind. Read our full disclosure here. 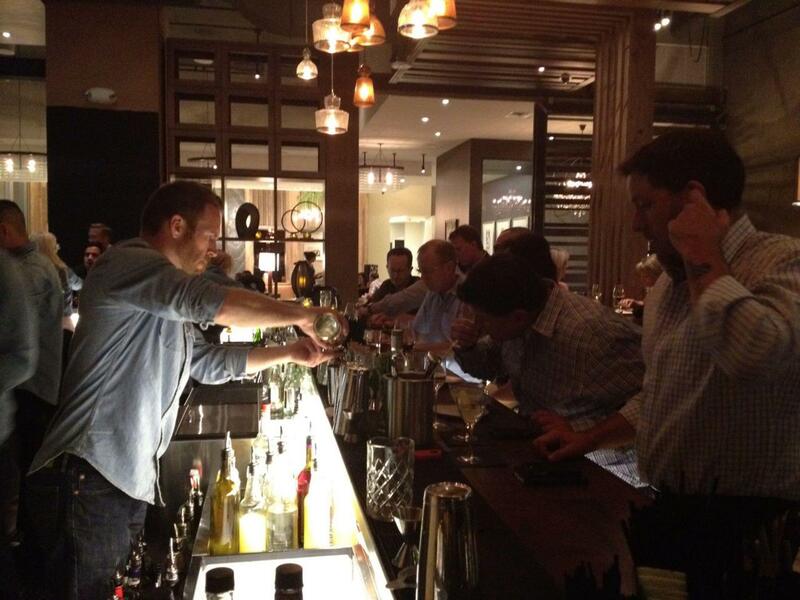 The Blue Hound Kitchen & Cocktails is located inside the Hotel Palomar in downtown Phoenix and is the city’s newest and, we think, best restaurant to come along in some time. This modern space is gorgeously designed and would not feel out of place in New York or San Francisco. This is big city dining at its finest. The rustic chic decor, the floor-to-glass windows, the quirky menus and the beautiful lobby create a hip, bustling experience unmatched in this city working hard to make its name as an urban powerhouse. The cuisine is a creative, upscale take on comfort food: bacon-infused tater tots and macaroni & cheese, along with generously-sized portions of braised beef ribs that are a must-try. For after dinner drinks, hit the Lustre Bar on the hotel’s rooftop, a laid-back outdoor lounge with yummy libations and sprawling views. The Blue Hound earns our highest recommendation. We covered Phoenix in our Dec. 2012 issue. Click here to subscribe! 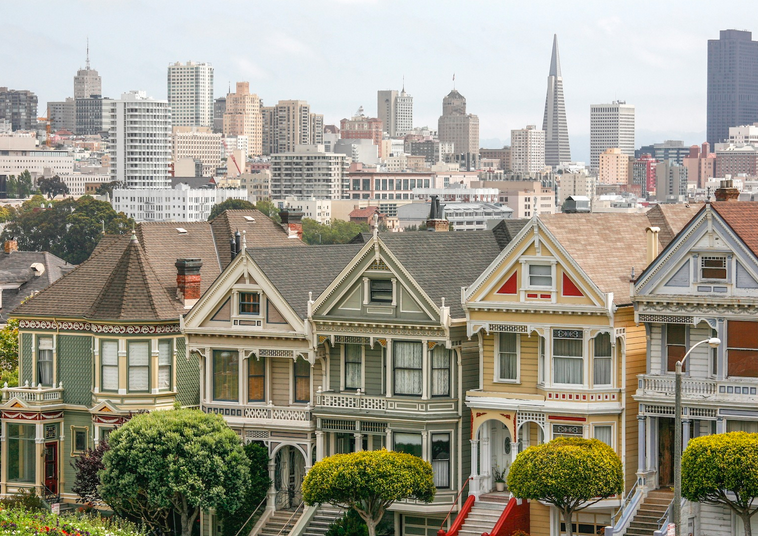 The City by the Bay like you’ve never seen it: Download our November issue and read a neighborhood-by-neighborhood update on what’s hot and happening in one of the most proudly out cities on the planet. Also in this issue: Discover Costa Rica and our six Now/Next destinations — Hong Kong, Santa Fe, San Diego, Melbourne, Vancouver, and Phoenix. Subscribers: Simply download the issue. In the ManAboutWorld app tap on “library” at the bottom of your iPad screen. If you have problems, click on our FAQ page or email us. Not yet a subscriber? (Est-ce possible?!) Claim your free trial issue by clicking this link to which takes you directly to ManAboutWorld’s product page in the App Store.